Google's Chrome extensions have only been in beta for a matter of days, but the amount of apps has nearly doubled since its launch on Tuesday. Around 300 apps were available as extensions to the Chrome browser at launch, but that number has swelled dramatically in a matter of days. In fact – with 553 at the latest count – it's clear that many developers have been eagerly awaiting the arrival of extensions for Chrome. One of Mozilla's Firefox browser's most widely appreciated options is its extensions, and it has a massive library to choose from. 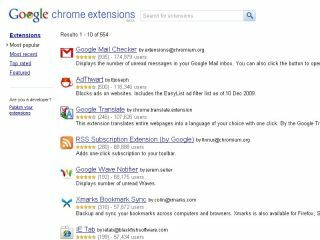 However, with Google expanding Chrome into an OS in 2010, the need for functional extensions was clear, and by launching to beta now there will be plenty to choose from by the time it becomes an integral part of full Chrome. One of the latest extensions is an official Google Docs Extension - bringing previews of files. "We didn't want to miss the extension party, so we created a Google Docs extension," wrote the Google Docs team on its official Blog. "The Google Docs PDF/Powerpoint Viewer makes it easy to preview PDFs, Powerpoint presentations, and other documents you find across the web in the Google Docs viewer, instead of downloading them."